Over the summer my family and I went to Hershey Park for a family vacation. And of course no trip to Hershey is complete without visiting Chocolate World, which includes their FREE ride teaching you how they make chocolate, and their MASSIVE gift shop complete with chocolate covered food court. And this is where I found these cookies and cream chips. What? I've always been obsessed with their cookies and cream bar. But to be able to put this into chip form? Yes!! Now after packing it in tons of ice to save it from melting in our 100+ degree car during out day at the park, I had to figure out what to do with it! So finally after a weekend of exhaustion, I decided to put them into blondies using this no fail recipe from Inspired Taste. This recipe is as simple as it gets, which is why I decided to make them. But... It does require some arm strength. It's a thick thick batter that needs a good whipping with a wooden spoon to beat it to submission. 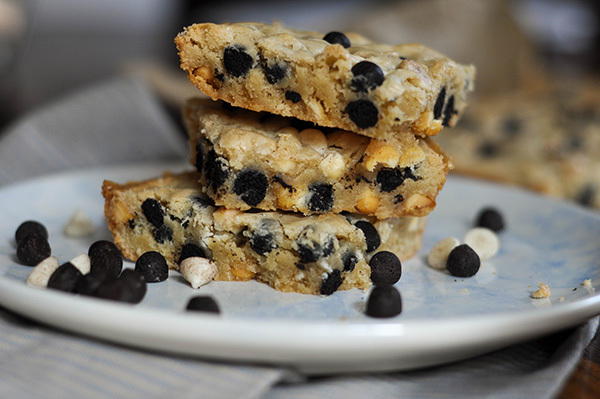 So get out that inner angst and make some blondies. Melted butter gets beat with some brown sugar. Then in goes the egg and vanilla. This all needs to be mixed well so that the batter stays smooth. Then the add the flour and beat this again for 40-50 strokes. Work it, work it real good. Then add the cookies and cream chips. Pour, or rather scoop this batter into a parchment lined baking dish. Spread it the best you can. I broke out the offset spatula to aid in this. I sprinkled more chips on top and add a sprinkle of sea salt. This is optional, but I like to offset very sweet deserts with a bit of salt. Then bake for 20-25 minutes. The hardest part is waiting till it cools before cutting into it. But this buttery, sweet blondie is totally worth the wait! 1 1/2 cup cookies and cream chips, I used Hershey's Cookies and Cream baking chips but you can also crush up Oreo cookies and add white chocolate chips! 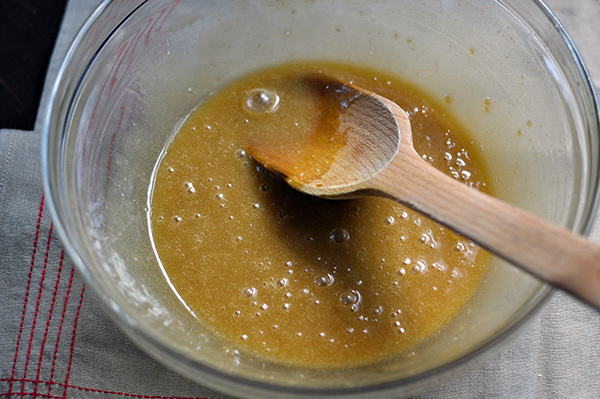 In a medium bowl, stir melted butter and brown sugar until blended. Add the egg, vanilla, almond extract (optional) and salt then stir vigorously until smooth. When the batter looks well blended, add the flour and stir until fully incorporated, then beat with the wooden spoon or spatula for 40 to 50 strokes. (The batter will be quite thick). Beat vigorously here. You want to see the batter pulling away from the sides of the bowl. Stir in the cookies and cream chips.